Our home health segment offers a wide array of service that can be administered at home for illness or injury. In many cases, recovering in your own home is preferred, less expensive and allows you to recover faster than institutionalized care. Some other benefits of home care include, the ability to remain independent, shorter and less frequent hospital visits and quality care in a timely manner. Home health care is usually less expensive, more convenient, and just as effective as care received in a hospital or a skilled nursing facility. These health care services may be covered by Medicare and Medicaid, Medicare replacement plans and most other commercial insurance plans. Supportive services such as homemaker, sitter, companion, or personal care may be covered by long-term care insurance or Medicaid, and can be paid out of pocket. The goal of this care plan is to help maintain your independence while improving your mental and physical health. Home health care is provided by skilled professionals including: Registered Nurses, Licensed Practical Nurses, Physical Therapists, Occupational Therapists, Speech Therapists and Medical Social Workers. These skilled clinicians deliver patient care based on physician’s orders in the comfort of your home. Home health aides provide hands-on, personal care and assistance with daily activities for seniors or disabled adults. 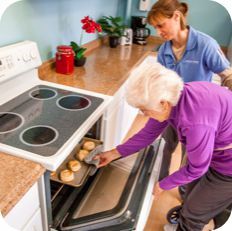 Privately paid home health aides help with personal care, home delivered meals, errands, shopping, medication reminders, prescription pick-up, and light housekeeping.